Today completes day 7 in my food intolerance journey! I couldn’t be more excited for a few reasons. One, I actually completed something I started. Two, My body has been pampered for 7 straight days. I’m sure my major organs and my gut are celebrating their first vacation from horrible intruders. It’s amazing how I actually look at food now. Today is my day off from the hospital so I knew I wanted to spend it researching more about inflammation, which I have dubbed the new buzz word. I decided a trip to the book store would be a treat. This is my reward for completing 7 full days. My daughter and I drive to Portland (about a 30 minute ride) so I thought it would be a good time to talk to her about what I have learned. She listened and was actually interested so I was pretty happy and received. There are so many things we could have talked about but I knew this was important. We have a very close relationship so if she had told me that she wasn’t exactly interested in this subject, I would have probably changed it. But…she was all ears! I found myself saying things like “I feel really good” and “I’m sleeping better than I ever have” and so on. it was saying affirmations. After our conversation, she was very interested in creating a plan that could work for her.I couldn’t ask for anything more. she already knows that gluten is a poison. When she was in college, she took gluten out for almost a month and realized she wasn’t getting her usual migraines. I was fixing her meals for her then and she was also shopping at Trader Joes which was very helpful. But as college went on, the gluten was reintroduced and the problems started all over again.So knowing that it has worked in the past is good reason enough to give this a try. We get to the book store and head to the magazine section. I notice she is looking at outdoor magazines and canning and self sustainable living magazines. Ah ha! She was listening. I head over to the natural food and health section to see who else is chatting about inflammation. I pick up a couple and flip through them but nothing really catches me. 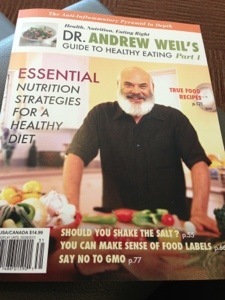 Then I see a Dr. Andrew Weil magazine and the top says “The Anti-inflammatory Pyramid in-depth”. I looked over at my daughter and said,”Is this the new buzz word? Is this that word I’m going to see everywhere now? How weird is this?”.I pick up his magazine and flip through it and every article is about inflammation. This was exactly what I was looking for. This was no coincidence. There are hundreds of magazines to choose from and this one catches my eye. It’s wonderful too! It’s very in-depth. I include a picture copy of the magazine below so when you look for it, you’ll recognize it. I’m convinced that I’ll be reading some of his books now. As a chef, I will also be creating new recipes to share. This is what I do. I find foods that people feel they no longer can enjoy and recreate them to their specific allergy so they can enjoy them. After all of these years, why wasn’t I ever doing this for myself? Why did I not feel I deserved to treat my body with the utmost respect? I’m ashamed. But I’m also happy that I have finally woken up to realize this is about me too. This is self-care. So why not take the gift I was given and share what I know with everyone. I decided to share my first recipe with you. It’s full of flavor, gluten-free, dairy free, soy free, sugar-free and corn free. I use this mediterranean dressing on everything. It’s wonderful on chicken and fish or just over rice and lentils. Mix in with the bowl of pure goodness. let sit overnight. It’s wonderful!! Add fresh herbs if you want too. I chopped a few chives in there because I had them. I also cut up an avocado for the salad. You can also spoon this over flatbread and add goat cheese (For those people who can tolerate goat cheese) and broil until the cheese melts. This such a nice recipe. The colors are beautiful. In season, chop fresh parsley and maybe even a red and yellow pepper for more color. So as my journey continues, I have two more weeks to go to complete the 21 days. As I said before though, I’m in no hurry to put any of these foods back into my body. They just don’t belong there. The fact that I saw Dr. Weil’s magazine was simply re-enforcement that I’m on the right track. It was no coincidence. Here’s to whole foods and positive cooking. Tags: anti-inflammatory, dairy free, food, gluten free, health, inflammation, love, magazines, nutrition, recipes, whole foods | Permalink.